The title of my assigned blog for SRC this month is Dessert Before Dinner. Everyone who knows me is aware that if I could get away with having dessert before dinner, I would in a heartbeat. Needless to say, I was excited to have the blog of someone who shares my same sentiments about dessert. Stephy cooks for a living, but the recipes on her blog are all of her creations that she makes in her own kitchen. She lives in Northern VA (that's where I live!) so I also found it really cool to read all of the reviews she has of local restaurants that I know of. 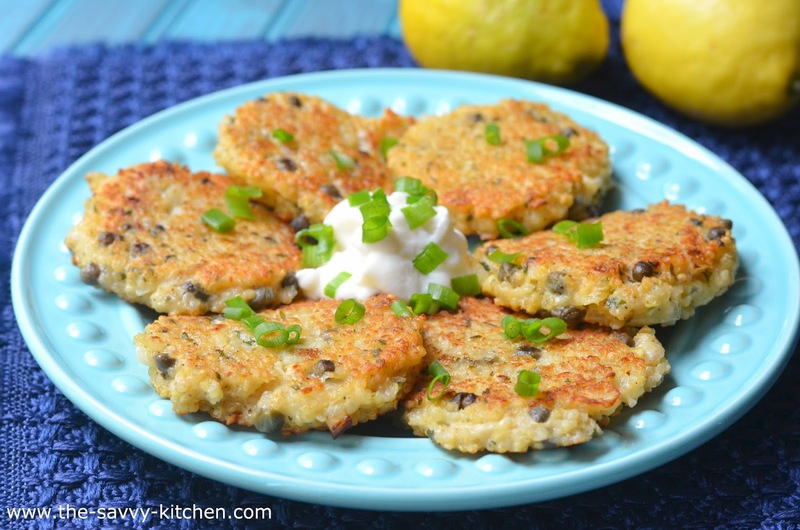 For today's post, I decided to go with these Lemon Caper Quinoa Patties. I love quinoa and am always on the hunt for new recipes that incorporate it. These patties are amazing. As if the crunchy crust on the outside isn't enough, the hint of lemon makes them light and refreshing, while the capers add a contrasting salty flavor and a pop of crunch. I love the mixture of unusual flavors in these patties...they surprisingly work extremely well together. Enjoy! Tip: You can easily substitute the flour for any type of gluten-free flour to suit your dietary needs. It serves as a binding agent, so the type you use isn't too important. Combine quinoa, water and soy sauce in a saucepan. Bring to a boil. Cover, reduce heat to a simmer, and continue cooking for 10-15 minutes or until all the water is absorbed. While quinoa is cooking, mix together remaining ingredients except olive oil, Greek yogurt and scallions. Once quinoa is done, add to capers mixture and combine well. Form into 8 patties (about 2-3 tablespoons per patty). Batter will be running, but that's okay. Coat the bottom of a skillet with a thin layer of olive oil. Add patties in an even layer and cook for 2-3 minutes per side, or until golden brown. Remove from skillet and place on a paper towel-lined plate. Serve immediately with greek yogurt and scallions, if desired. 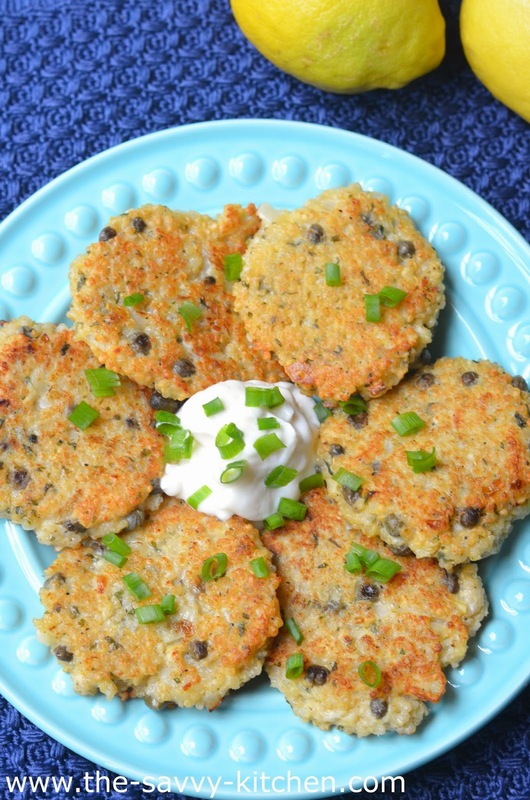 Glad you liked these lemon quinoa patties. I haven't made them in so long, but it's glad fun to see a recipe from a bit further back. These look great and I"m sure they're even better with the greek yogurt. Thanks for the wonderful writeup! I only just discovered quinoa and am also looking for new ways to fix it. This is my next project. Thanks for this one. Wow, I have everything to make these but the Greek yogurt. Pinning! They sound great. What a fresh creative recipe! 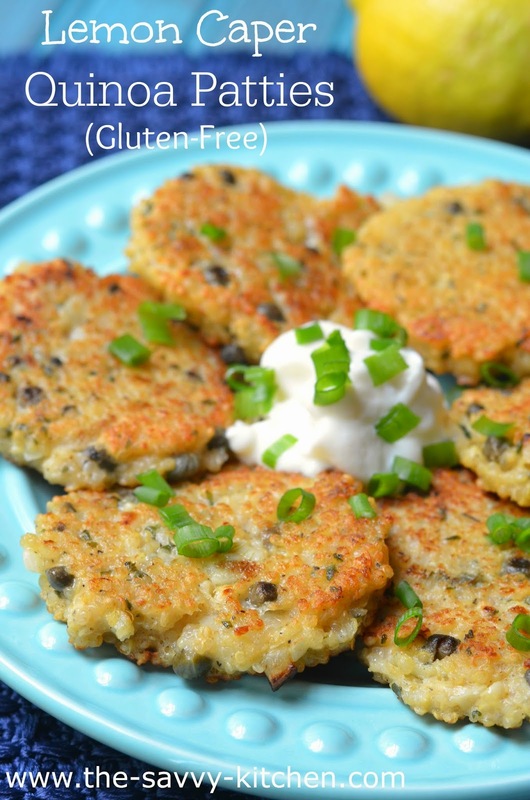 I'd love to try these with other grains too like farro or wild rice - yum.